The use or misuse for the sale, design, supply, process, installation, delivery, test, repair, servicing, and alteration of the designs, instructions, computer code, photographs, circuits, and any other information that appear on this web site is entirely at the risk of the user or visitor to the web site. The information is made available in good faith strictly on the basis that no liability will attach to the Model Electronic Railway Group (MERG), its officers and members. AC Alternating Current - Generally with a sinusoidal wave form. Mains power in Britain and Europe is 230v AC at 50Hz, that is 50 complete cycles per second. USA uses 115v at 60Hz. Accessory decoders DCC decoders are used to control trackside accessories such as turnouts and signals using the NMRA standard pulsed signal. The signal can be arried by the track and track feeders or can be a separate circuit, which avoids the risk of a derailment or short reventing the control of the turnouts. All DCC manufacturers make accessory decoders and MERG provide kits. Accessory encoder The MERG DCC accessory system is designed to be independent of the track DCC although it uses the NMRA Standard for its information encoding. API Application Program Interface - A set of routines / protocols and tools for building software applications. AWG American Wire Gauge- This is not the same as Standard Wire Gauge. There is no direct conversion in that the ratio of radii SWG/AWG varies from 0.8 at 6/0 to 1.64 at 43. Baud Most people use baud to describe modem speeds in bits per second--but they are wrong. They may say a 9,600-bps modem transmits at 9,600 baud, but really baud is a measure of how frequently sound changes on a phone line. Modern modems transmit more bits with fewer changes in sound, so baud and bps numbers are not equal. However, only editors, pedants, and communications engineers now care about the distinction. But if you run into members of these groups, use bps instead of baud. BC3 The BC3 is an automatic block control system. It controls the speed of a model train depending on the occupation of the block ahead. If the block ahead is uccupied the train will slow to a creep speed and stop at a designated point. Otherwise the train will accelerate to a preset speed. Manual control is also allowed for. Kits for the BC3 and literature about it is available from MERG - TBs T33/0-20. Bell signals Bell Signals were used to convey information from between signal boxes. Block Control Block control is the philosophy that a railway should be divided into blocks and that no train should normally be allowed to enter a block which is already occupied. This means that each block has a stop signal at which a train is required to wait if the block ahead is occupied. This will be set back 0.25 mile from the start of the next block. Further back there will be a distant signal which informs the driver that he needs to slow because the signal ahead is at stop. BloNg BloNg (Block Oriented N-Gauge) controller was the original automatic block controller developed by the South-West Area Group of the N-Gauge Society. The BC3 resulted from a collaboration between the SW Area Group and the Oxford MRS, who also model in 00. The BC3 now replaces the BloNg controller, with which it is electrically compatible. Exeter N Gauge Railway Modellers: Members each bring their own modules to be set up during the morning. Modules feature BloNg control and intermodule track adjusters as described in the N Gauge Journal. Boolean Boolean logic is the convention used in mathematics and circuitry for digital decision making. These are written as a statement which can be TRUE or FALSE. These statements can be joined by Boolean operators to form more complex statements which also are TRUE or FALSE. These statements have their parallels in electronic logic where the conditions of TRUE or FALSE are represented by the presence or absence of voltage and the operators are integrated chips. Bps In telecommunications and computing, bit rate (sometimes written bitrate or Rbit) is the number of bits that are conveyed or processed per unit of time. In digital multimedia, bit rate is the number of bits used per unit of time to represent a continuous medium such as audio or video. It is quantified using the bit per second (bit/s) unit or some derivative such as Mbit/s. Bridge rectifier A diode bridge (occasionall called a Graetz bridge)is an arrangement of four diodes connected in a bridge circuit as shown below, that provides the same polarity of output voltage for any polarity of the input voltage. When used in its most common application, for conversion of alternating current (AC) input into direct current (DC) output, it is known as a bridge rectifier. The bridge recitifier provides full wave rectification from a two wire AC input (saving the cost of a center tapped transformer) but has two diode drops rather than one reducing efficiency over a center tap based design for the same output voltage. The diagram shows the operation of a bridge rectifier as it converts AC to DC. Notice how alternate pairs of diodes conduct. Buffer In computing, a buffer is a region of memory used to temporarily hold output or input data, comparable to buffers in telecommunication. The data can be output to or input from devices outside the computer or processes within a computer. Buffers can be implemented in either hardware or software, but the vast majority of buffers are implemented in software. Buffers are used when there is a difference between the rate at which data is received and the rate at which it can be processed, or in the case that these rates are variable, for example in a printer spooler. Buffers are allocated by various processes to use as input queues, etc. Most of the time, buffers are some processes output, and they are file buffers. A simplistic explanation of buffers is that they allow processes to temporarily store input in memory until the process can deal with it. Bus An electrical bus (sometimes spelled buss) is a physical electrical interface where many devices share the same electric connection. This allows signals to be transferred between devices (allowing information or power to be shared). A bus often takes the form of an array of wires that terminate at a connector which allows a device to be plugged onto the bus. Buses are used for distribution of electrical power to components of a system. The (usually) thick conductors used are called busbars. In an electrical laboratory, for example, a bare bus-bar will sometimes line the wall, to be used by the engineers and technicians for its high electrical current carrying capacity, which allows a convenient approximation to zero voltage, or ground in the US, and earth in the UK. In analysis of an electric power network a "bus" is any node of the single-line diagram at which voltage, current, power flow, or other quantities are to be evaluated. These may or may not correspond with heavy electrical conductors at a substation. C/MRI Bruce Chubb's Computer/Model Railroad Interface system C/MRI. A series of modules and support available for the system obtained from JLC Enterprises Inc.
Capacitor A capacitor can store electric energy when disconnected from its charging circuit, so it can be used like a temporary battery. Capacitors are commonly used to supply energy to electronic devices without the memory being lost when changing their batteries. Capacitors are used in power supplies where they smooth the output of a full or half wave rectifier. They can also be used in charge pump circuits as the energy storage element in the generation of higher voltages than the input voltage. Capacitors are connected in parallel with the power circuits of most electronic devices and larger systems (such as factories) to shunt away and conceal current fluctuations from the primary power source to provide a "clean" power supply for signal or control circuits. Audio equipment, for example, uses several capacitors in this way, to shunt away power line hum before it gets into the signal circuitry. The capacitors act as a local reserve for the DC power source, and bypass AC currents from the power supply. Capacitors may retain a charge long after power is removed from a circuit; this charge can cause shocks (sometimes fatal) or damage to connected equipment. For example, even a seemingly innocuous device such as a disposable camera flash unit powered by a 1.5 volt AA battery contains a capacitor which may be charged to over 300 volts. This is easily capable of delivering an extremely painful, and possibly lethal shock. Many capacitors have low equivalent series resistance (ESR), so can deliver large currents into short circuits, and this can be dangerous. Care must be taken to ensure that any large or high-voltage capacitor is properly discharged before servicing the containing equipment. For safety purposes, all large capacitors should be discharged before handling. For board-level capacitors, this is done by placing a bleeder resistor across the terminals, whose resistance is large enough that the leakage current will not affect the circuit, but small enough to discharge the capacitor shortly after power is removed. High-voltage capacitors should be stored with the terminals shorted to dissipate any stored charge. CE The CE mark (officially CE marking) is a mandatory marking on certain products, which is required if they are placed on the market in the European Economic Area (EEA). By affixing the CE marking, the manufacturer, or its representative, or the importer assures that the item meets all the essential requirements of all applicable EU directives. Examples of European Directives requiring CE marking: Toys-, Machinery-, Low Voltage equipment-, R&TTE-, EMC-Directive. There are about 25 Directives requiring CE marking. Ceramic The word ceramic is derived from the Greek word κεραμικος (keramikos, "having to do with pottery"). The term covers inorganic non-metallic materials whose formation is due to the action of heat. Channel Programmable 4 - channel Servo Driver Type ‘Servo4’ For operation of model railway accessories such as turnouts and semaphore signals. The word channel refers to the ability to control 4 devices. Charlieplexing Charlieplexing is a method of matrix multiplexing which uses each wire in turn as the sink. Cleaning Tracks There is a commercial product called Relco. More information on cleaning tracks can be obtained from Southern E-Group web site. Clearing point This is a location in advance of a signal box up to which the track must be clearto allow a signalman to accept a train into a block section. Clock In electronics and especially synchronous digital circuits, a clock signal is a signal used to coordinate the actions of two or more circuits. A clock signal oscillates between a high and a low state, normally with a 50% duty cycle, and is usually a square wave. Circuits using the clock signal for synchronization may become active at either the rising or falling edge, or both. CMOS CMOS ("see-moss"), which stands for complementary metal-oxide semiconductor, is a major class of integrated circuits. CMOS chips include microprocessor, microcontroller, static RAM, and other digital logic circuits. The central characteristic of the technology is that it only uses significant power when its transistors are switching between on and off states. Consequently, CMOS devices use little power and do not produce as much heat as other forms of logic. CMOS also allows a high density of logic functions on a chip. The word "complementary" refers to the fact that the design uses pairs of transistors for logic functions, only one of which is switched on at any time. Com port In computer hardware, a port serves as an interface between the computer and other computers or devices in the form of an electrically wired outlet on a piece of equipment into which a plug or cable connects. These hardware ports have different physical shapes such as male, female, round, rectangular, square, oblong, etc. There is some standardization to physical properties and function. For instance, most computers have a keyboard port (currently round, or telephone type), into which the keyboard is connected. Command station The Command Station is the brains of a DCC system of control and is in control of the whole system. After receipt of requests from one or several cabs or throttles, the command station’s internal computer translates these cab requests into decoder commands in the form of digital packets. These are received via the track in the decoders fitted in locomotives or other accessory decoders such as the type used to control points and signals. Common A wire or connector that is Common or connected to all the components of a circuit. Computer Control Software Software designed specifically to control the activities of a model railway. Can provide a visual indication on the computer screen of every aspect of the control system. There are commercial software systems available as well as software developed by MERG members. Conductor Conductors are materials that allow electrical charges to flow through them. They are the opposite of insulators. Also see semi-conductor. Control Systems A Control System as applied to model railways can be any system that controls the activities of the railway. Crystal Oscillator that uses a quartz Crystal in its feedback path to maintain a stable output frequency. CSA Believed to be an out dated method of assessment overtaken by the CE marking on products. Measured in amperes, it is the flow of electrons through a conductor. Also know as electron flow. Current shunt In electronics, a Current Shunt is a device which allows electrical current to pass around another point in the circuit. CVs A CV is a configuration variable that is a characteristic of a DCC decoder that can be customised by the user. CV’s are defined by the NMRA. For example the address of a locomotive is located in CV1. Significant modifications can be made to the performance of a locomotive by changing the CV’s. D type connector A D type connector is usually with 9 or 25 pins to connect computer cables. It is in two parts. A socket or female connector and a male plug. It is known as a D type connector due to the D shape of the surround to the pins and socket. DC Control DC or direct current, usually from a 12v supply, is the traditional method of controlling and powering model locomotives by varying the voltage supplied to the track. DCC Digital Command Control DCC Digital Command Control systems, both analogue and digital, allow you to simulate prototypical train operation on your model railroad. With Digital Command Control you can operate multiple locomotives independently at the same time on the same section of track without a computer and without blocking or other complex wiring schemes. Digital Command Control systems use digital data packets to communicate commands to decoders that control locomotives and turnouts on the railroad. Simply put, DCC will let you "run your trains, not your track." DCC gives you the freedom to bring your railroad to life! With DCC you have truly prototypical operation at your fingertips. DecoderPro A better tool for programming decoders. DecoderPro simplifies the job of configuring complicated DCC decoders by providing screens on which you can select the various options and values you want. Modern DCC decoders are complicated beasts to program. The simple idea of "put the address in CV01" doesn't cope well when you program complicated functions using combinations of bit patterns. A friendlier interface is needed. There are programs that provide better ways of programming specific decoders. Unfortunately, they are limited to specific types of computers, and only their authors can customize them for new types of decoders. Decoupling capacitor Decoupling capacitors are used to prevent transfer of high-frequency noise between electrical nodes. The most common use of decoupling capacitors is on power supply rails where they prevent voltage drop when transient voltage spikes/current spikes are experienced. These capacitors can be viewed as small localized energy reservoirs. Digital The word digital is most commonly used in computing and electronics, especially where real-world information is converted to binary numeric form as in digital audio and digital photography. Such data-carrying signals carry either one of two electronic or optical pulses, logic 1 (pulse present) or 0 (pulse absent). The term is often meant by the prefix "e-", as in e-mail and ebook, even though not all electronics systems are digital. Digitrax Digitrax is a sullpier of DCC systems located in Norcross, Georgia (just outside Atlanta). They supply a full range of command stations, decoders and accessories. DIL Dual in line sockets DIL. A socket usually plastic for soldering to a printed circuit board to receive the pins of a computer chip. Diode The DIODE is an electronic component that allows the passage of current in only one direction. They are solid state semiconductor devices and typically need more than 0.6 volts to operate. In a normal diode, current flows from the positive anode to the negative cathode. Early diodes were in reality, vacuum-tube rectifiers, consisting of an evacuated glass or steel envelope containing two electrodes—a cathode and an anode. Because electrons can flow in only one direction, from cathode to anode, the vacuum-tube diode could be used as a rectifier. That is still a use of diodes in today's electronic circuits; now they are all semiconductor diodes. The simplest of these, the germanium point-contact diode, dates from the early days of radio, when the received radio signal was detected by means of a germanium crystal and a fine, pointed wire that rested on it. 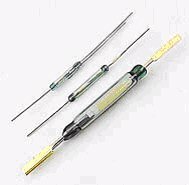 In modern germanium (or silicon) point-contact diodes, the wire and a tiny crystal plate are mounted inside a small glass tube and connected to two wires that are fused into the ends of the tube. Junction-type diodes consist of a junction of two different kinds of semiconductor material. There are literally thousands of different specification diodes. They are usually identified with a number but some are colour coded. You can use our Diode Colour ID Band Table to identify such diodes. suitable for ‘small signal’ circuitry such as Audio/Video equipment. the specification of the relays. The module is designed to be Control Panel mounted, as part of an RPC (remote panel control) system by a MERG member. DPST Double Pole Single Throw (DPST) A switch that connects or disconnects one input to one output. Electro frog Is a Peco term for live (power) frog Turnout (Switch or Points),which some people call power-routing. Fets The field effect Transistor is a device which us to use one electrical signal to control another. The name ‘transistor is a shortened version of the original term transfer resistor, which indicates how the device works. Most transistors have three connections. The voltage on (or current into/out of) one wire has the effect of controlling the ease with which current can move between the other two terminals. The effect is to make a resistance whose value can be altered by the input signal. We can use this behaviour to transfer patterns of signal fluctuation from a small input signal to a larger output signal. Flip flop “Flip Flop” is the common name given to a two-stage device, which offer basic memory for sequential operation. Flips flops are heavily used for digital data transfer and are commonly used in banks called “registers for the storage of binary numerical data. Frequency Frequency is the measurement of the number of times that a repeated event occurs per unit of time. GPP software This is a company that has written a Microsoft Basic program to control a model railway from a computer. Ground Is a common point in circuits normally 0 volts, but can be higher than 0 volt. Heat sink Waste heat is produced in transistors due to the current flowing through them. Heat sinks are needed for power transistors because they pass large currents. If you find that a transistor is becoming too hot to touch it certainly needs a heat sink! The heat sink helps to dissipate (remove) the heat by transferring it to the surrounding air. Hysteresis loop Hysteresis is wellknown in ferromagnetic materials. When an external magnetic field is applied to a ferromagnet, the ferromagnet absorbs some of the external field. Even when the external field is removed, the magnet will retain some field: it has become magnetized. ICs Integrated Circuits are usually called ICs or chips. They are complex circuits which have been etched onto tiny chips of semiconductor (silicon). The chip is packaged in a plastic holder with pins spaced on a 0.1"(2.54mm) grid which will fit the holes on stripboard and breadboards. Very fine wires inside the package link the chip to the pins. Incandescent lamps Lamps emit light when an electric current passes through them. All of the lamps shown on this page have a thin wire filament which becomes very hot and glows brightly when a current passes through it. The filament is made from a metal with a high melting point such as tungsten and it is usually wound into a small coil. Inductor An inductor is a coil of wire which may have a core of air, iron or ferrite (a brittle material made from(iron). Its electrical property is called inductance and the unit for this is the henry, symbol H. 1H is very large so mH and uH are used, 1000uH and 1000mH=1H. Iron and ferrite cores increase the induction. They pass DC easily, but block AC signals ,This is the opposite to capacitor. clear plastic with a smoke color lens. JMRI Java Model Railroad Interface: The main information on this open source software initiative. There is a Yahoo Group providing support. Latching A pulse method to change the state from on to off or vice versa. Logic In a model railway it is a way to do step by step sequence to make the train do what you require. Magnet A magnet is an object that has a magnetic field. It can be in the form of a permanent magnet or an electromagnet. Microprocessor A microprocessor (sometimes abbreviated µP) is a programmable digital electronic component that incorporates the functions of a central processing unit (CPU) on a single semiconducting integrated circuit (IC). Multiplexor A communications device that multiplexes (combines) several signals for transmission over a single medium. A demultiplexor completes the process by separating multiplexed signals from a transmission line. Frequently a multiplexor and demultiplexor are combined into a single device capable of processing both outgoing and incoming signals. NOR Nor is a gate term used to describe logic components. NPN Types of transistor: There are two types of standard transistors, NPN and PNP, with different circuit symbols. The letters refer to the layers of semiconductor material used to make the transistor. Most transistors used today are NPN because this is the easiest type to make from silicon. If you are new to electronics it is best to start by learning how to use NPN transistors. Ohms Definition: >An ohm is a resistance that produces a potential difference of one volt when a current of one ampere is flowing through it. Opto-isolator Optoisolator: A light-emitting diode (LED) or infrared-emitting diode (IRED) and a photodiode combined in a single package with a transparent gap between them. The LED or IRED converts an electrical signal to visible light or IR; the photodiode changes the visible light or IR back into an electrical signal. This device eliminates interstage impedance reflections that can plague systems that employ electronic coupling. Even the most drastic changes in load impedance have no effect on the impedance “seen” by the signal source. Parallel 1 . Pertaining to the shunt connection of components or circuits. 3. The condition in which two comparably sized objects or figures are equidistant at all facing points parallel). Phase 1. The angular relationship between two points in time of a sine wave. 2. The angular relationship between two sine waves simultaneously. Polarity 1. The condition of being electrically positive or negative. 2. The condition of being magnetically north or south. 3. The orientation of the positive and negative poles in a battery or power supply relative to a circuit. 4. The orientation of a magnetic field, relative to the surrounding environment. Positive 1. The condition of being electrically positive or negative. Potentiometer 1. A variable resistor used as a voltage divider. The input voltage is applied across the entire resistance element and the output voltage is taken from the wiper, relative to one end of the element. One end is usually grounded (at zero potential). Power district Power to the track is divided into sections. Can be to assist fault finding, to avoid shutting down the whole layout if a short occurs, and in large layouts to provide separate power supplies one to each district. Power pack A controller including a power supply to the track. Rectification The process of converting alternating current (AC) to direct current (DC). most offten using diodes. The diodes are commonly arranged in a set of 4 combined in one package. See also "Bridge rectifier". Reed Switch The contacts of a reed switch (usually SPST) are closed by bringing a small magnet near the switch. They are used in security circuits, for example to check that doors are closed. Standard reed switches are SPST (simple on-off) but SPDT (changeover) versions are also available. Warning: reed switches have a glass body which is easily broken! Regulated power supply This is a typical simple regulator supply using an LM317Integrated circuit. Zener diodes can also be used to regulate low power to fixed levels. 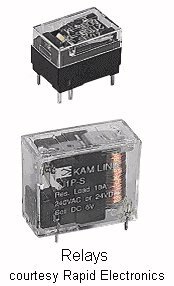 Relays A relay is an electrically operated switch. Current flowing through the coil of the relay creates a magnetic field which attracts a lever and changes the switch contacts. 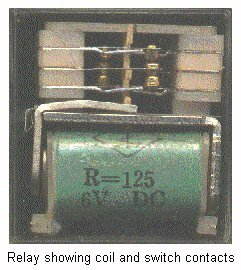 The coil current can be on or off so relays have two switch positions and they are double throw (changeover) switches. Resistor Resistor is the name for an electronic component exhibitingResistance. Resistance is the property of a component which restricts the flow of electric current. Energy is used up as the voltage across the component drives the current through it and this energy appears as heat in the component. Resistance is measured in ohms, the symbol for ohm is an omega. 1 is quite small for electronics so resistances are often given in k and M.1 k = 1000 1 M = 1000000. Resistors used in electronics can have resistances as low as 0.1 or as high as 10M. Resistor network A set of resistors combined in one package for convenience in assembling circuits. Often abbreviated to "Resnet". Resonator A device used to produce an oscillation of a specific frequency, primarily for use as the clock signal for digital circuits. Reverse polarity The Positive voltage goes to the Negative part of a circuit and vice versa. Risk assessment An analysis of the risks and the method of management in a strategy or practice. RMS This is what you read on an analogue meter used on AC voltage. It compares to the dc level. So it’s an average value. Road Vehicle Control Usually refers to a electronic system to control model road vehicles. Route setting This is used when you operate a set of instructions to drive a train from A >>>B with all the instructions to operate points and signals. Seep motor Proprietary brand of double solenoid motor for operating model points. Semaphore Railway signal giving indications to the train driver by means of the position of a mechanical arm. Solid conductor Category 5e and Category 6 network cable comes in a solid conductor format, and in stranded conductor formats. People often ask which is appropriate for their application. We'll detail the difference between two types of cable, and help you decide which application is suits which cable. Sprog SPROG is a computer based programmer for DCC decoders. SRI4 Part of the RPC series of products offered by MERG member Gordon Hopkins. SRI4 provides for the RPC system to read up to 4 Bytes (=32 bits) of logic data for transmission to the remote panel or computer. SRO4 Part of the RPC series of products offered by MERG member Gordon Hopkins. SRO4 provides for the RPC system to write up to 4 Bytes (=32 bits) of relay drive data for transmission to the layout from the remote panel or computer. Star network Star Network is a generic term that describes any network that is configured like the rays of light that radiate from a star, that is, there is a centre point and all other points radiate out from the centre. A Star Network is often recomended for use in the ground system of sensitive equipment, where each separate element is separately connected to the central ground point or 'Star Point', this is done so that individual ground currents do not flow in common wires and thus interfere with each other, probably causing crosstalk which can spoil an HiFi installation with 'Hum' or can cause unreliable operation in a digital system. Stationary decoder For MERG this usually refers to a DCC decoder that is not intended to be mounted in rolling stock. When a process starts, it may cause surges of the working fluids (eg water/steam/electricity) after the initial acceleration the process may be assumed to continue at constant level, or to have reached 'Steady State'. A good example is a car starting from cold and accelerating from rest to a cruising speed...during acceleration fuel consumption is high, but this settles to steady state conditions in the cruise and as the entire machine warms up. For MERG one explanation for 'Steady State Decoder' is to distinguishit from 'Pulsed Decoder'. The pulsed decoder is usually related to solenoid switch machine, which requires a capacitor discharge device to provide high transient power (maybe 5Amps for 20mS). In contrast the steady state decoder is intended for non pulsed functions, such as micromotor operated machines, and can have a lower cost design. Stranded conductor Stranded wire is composed of a bundle of small-gauge wires wrapped in a single piece of insulation to make a larger conductor. Stranded wire is more flexible than a single, thick strand of the same gauge, or crossectional area. Another form of Stranded Wire is called "Litz wire" which is used in coils that are used as inductors in high-frequency tuned circuits, because at high frequencies electricity travels near the outside of the wire. This is called the skin effect. Super Bloc This is the Name for a set of ideas and kits started by MERG member JJ Matthews and his team which provides for automation of the principle of block control, observing signal logic and providing smooth accelerations, if required without human intervention. Surface Mounted Components In the context ofMERG this refers to electronic components that are intended to be mounted directly by being soldered onto the conducting tracks on the surface of a printed circuit board (PCB), usually without drilling any holes. The opposite is 'Through Hole Mounted' in which all the connections pass through the PCB to be soldered on the side opposite to the component. SWG Standard Wire Gauge, this is the Imperial standard for wire gauges, the reference shows a table of sizes for this series and the American similar (but different) table 'AWG'. The simplest is an electrical switch, as in 'Light Switch' which is amechanically operated device used for connecting or disconnecting electrical circuits. Such switches can have many contacts and become quite complex. The second meaning is the American term for the English 'Points'...this being the scheme to allow a railway track to diverge or converge with another route. It allows the path of the train to be 'switched' from one route to another. Slow Motion: usually small DC motor operated. Switch mode A switched-mode power supply, switching-mode power supply or SMPS, is an electronic power supply unit (PSU) that incorporates a switching regulator. While a linear regulator maintains the desired output voltage by dissipating excess power in a "pass" power transistor, the SMPS rapidly switches a power transistor between saturation (full on) and cutoff (completely off) with a variable duty cycle whose average is the desired output voltage. Tag strip Point-to-point construction uses terminal strips (also called 'tag boards' of 'tag strips'). A terminal strip is a stamped strip of tin-plated loops of copper. It is mounted in a way that electrically insulates it. The metal loops are mounted on a cheap, heat-resistant material, usually synthetic-resin bonded paper (FR-2), or bakelite reinforced with cotton, or sometimes paxolin. The insulator has an integral mounting bracket, sometimes shorted to the stamped loops to ground them to the chassis. Technical Data This is a generic term used in Electronics to describe 'data sheets' for electronic parts or components, or to describe the engineering oriented detailed description of a product. It may include absolute maximum limiting factors, typical performance, operating limits, power consumption etc. Throttle/handset The Throttle controls the power output of an internal combustion engine, in model railways it represents the, usually electrical, controller that is used to adjust the speed of the train being driven. Timers The basic timer is the Kitchen Timer, consisting of some sort of clock and alarm that can be set as required. Toggle A 'Toggle' is a combination of an operating lever and spring loading which causes the lever to be 'locked' at one or other extreme position. It is extensively used in mechanical assemblies, in which the extremes may be 'locked' by the 'toggle spring'. Another example is the 'Mole' self locking wrench in which the toggle action also gives strong mechanical advantage. Toti Train-on-Track Indicator. A device or electronic circuit designed to interwork with, or form part of a track circuit which provides an output suitable for connecting to signalling, an indicator panel or other electronic component such as a computer, when a piece of track or block section is occupied by a train or item of rolling stock. There are a number of MERG designs featuring amongst the Technical Bulletins, three of which have been offered as kits. See kits nos.56 (DCC only), 62/63 (DC and DCC) and the RPC FTC module. Track cleaner A device for cleaning track so that dirt or other deposits do not impede the flow of electric current. A number of methods exist to accomplish this. MERG Technical Bulletin A4/1 features the Relco Track Cleaner which superimposes a high frequency, high voltage signal over the traction current. This burns through track deposits when traction is interrupted. Mechanical abrasive rubber-type products are also available such as the Peco PL41 Rail Cleaner and the MERG kit 83, PCB and Track Cleaner. These must be rubbed over the track to clean it. A variety of solvents applied with a clean cloth are also suitable as are a number of wagon-mounted abrasive blocks. A popular MERG method is to polish the rail tops with the rough surface of common hardboard. Transducer A collective term used to describe devices that convert one form of energy into another, generally for the purpose of detection, measurement, actuation or information transfer. 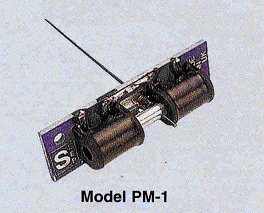 Most often of electrical or electronic nature, the most common forms of transducer are either sensors or actuators and thus find common usage in model railway systems. Such examples can be found in a number of MERG kits for train detection and turnout actuation and are either the device that physically detects the presence of rolling stock such as a Hall effect switch or infrared sensor or the coil that drives a turnout throwbar. Transformer A electrical device consisting of two or more coils of insulated wire wound round an iron core to allow a focussed and fluctuating magnetic field generated by the alternating current in one coil to induce an alternating current in the other coil(s). Most frequently used to change the voltage of a power distribution or electronic signal from a high value to a lower value or vice versa. Commonly found in the mains power distribution network between power station and consumer and usually found in the power supplies of most appliances used in the home. Transistor A triple-layered semiconductor assembly made from doped silicon or germanium arranged so that potential differences between the layers allow this device to be used as an amplifier, switch, voltage stabiliser, signal modulator and many other uses. Positive-doped layers are termed P and negative-doped layers are termed N so that transistors can be NPN or PNP, operation of one being the inverse of the other. Control is achieved by allowing a small current to flow into the centre layer, called the Base, and this invokes a larger current to flow between the outer layers, the Emitter and the Collector. Transistors feature either as individual components or packed in many thousands into Integrated Circuits and form the basis of modern electronic technology. First patents were filed for a transistor as early as 1928 and again in 1934 but the first successful device is believed to have been constructed by Bell Labs in 1947. The leads are labelled base (B), collector (C) and emitter (E). These terms refer to the internal operation of a transistor but they are not much help in understanding how a transistor is used, so just treat them as labels! Turnout actuator A collective term that refers to the device that switches turnouts by means of a mechanical linkage, so that trains can be diverted from one track to another. A common example is the twin solenoid arrangement that, when pulsed with an electric current, cause the turnout throwbar to switch from one side of the track to the other. Actuators can also consist of high torque motors or servos that change the turnout direction in response to an applied control signal. Twinkling The description given to the fast, frequent and random change of brightness of a light source. The most common example is to be found in the appearance of stars in the night-time sky which twinkle in response to random fluctuations of water vapour density in the Earth's atmosphere affecting the path of the stars' light. A MERG kit is available (kit 61, Gas Lamp Twinkler) which applies random variations of current to a connected LED thus simulating a twinkling gas lamp. Unregulated power supply A Power Supply Unit (PSU) in which there is no controlled stabilisation of the voltage output applied electronically. The voltage supplied by a loaded PSU is therefore lower than one which has no load connected due to the increase in output current having a variety of effects, principally through impedance or resistance in the PSU components. USB The shorthand term used to denote a standard Universal Serial Bus developed to allow the interconnection of many peripheral devices such as mice, keyboards, joysticks, scanners etc., to a computer such as IBM compatible and Apple PCs. Developed by collaboration amongst leading companies in the computer and electronics industry, the specifications are standardised by the USB Implementers Forum (USB-IF). USB 3 has recently become more readily available and offers speeds up to 5Gbps. Volt A unit of electromotive force defined as the potential difference across a conductor when a current of 1 ampere dissipates 1 watt of power. Used as the universal measure of electrical 'force' across the World, it was named in honour of the Italian physicist Allessandro Volta who invented the first chemical battery. Its precise value was fixed by the 18th General Conference on Weights and Measures in 1948 and is maintained internationally for practical measurement by the US National Institute of Standards and Technology (NIST) through the development of the Josephson junction array chip. Voltage regulator An electronic circuit composed of discrete components or packaged in an Integrated Circuit, which is designed to render the output voltage of a PSU or other device, constant irrespective of load applied. A simple semiconductor example is a zener diode but many more complex designs are now available at a range of output values and powers such as those incorporated into the 7800 and 7900 series IC regulators. Watt A unit of power most often used in the electrical and electronic industries and is defined as one joule of energy per second. Named after the British Engineer James Watt, it was adopted by the Second Congress of the British Association for the Advancement of Science in 1889. All household appliances have the amount of power in watts that they consume imprinted somewhere on the casing. Watts in the electronic arena are calculated as volts x amperes. Zener diode A type of diode named after the American physicist Clarence Melvin Zener who discovered a method of creating controlled breakdown at a specific voltage in a specially doped P-N semiconductor junction. When reversed biased, the zener diode behaves like a conventional diode and passes little or no current until the reverse voltage reaches the breakdown voltage when current will begin to flow. At this point the reverse voltage is maintained more or less constant irrespective of increase in current so that the zener diode can be used as a reference or stabilising component for voltage regulation. Zener diodes are available at a range of breakdown voltages which are quite accurately defined by the doping process in the manufacturing stage. 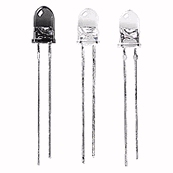 See the BZX84 (0.3w), BZX55 (0.5w) and BZX85 (1.3w) series of diodes. Zero 1 An early form of Command Control for model railways, Zero 1 was launched in 1979 and systems incorporating the technique were marketed by Hornby and Hammand and Morgan. Now obsolete, having been overtaken by the DCC system, Zero 1 pioneered the concept of controlling model railway motors by establishing a constant track power source that included control signals to define locomotive identity, speed and direction. The MERG series of Technical Bulletins CC1 written when Zero 1 was popular, remain an important source of information and techniques on this system. A MERG kit 71 is still offered which provides replacement parts for Zero 1 system keyboards. Some of the DCC decoders supplied by ZTC Controls Ltd. can also be used with the Zero 1 system. ZIMO ZIMO ELEKTRONIK, an Austrian company based in Vienna, first launched a digital model railway control system in 1979 and progressively developed the system through the 1980s and early 1990s to include decoder BEMF, block control, route setting and a push button CTC panel amongst other advanced functions. Switching to the emerging DCC standard in 1996, ZIMO swiftly gained a reputation as the 'Cadillac' of DCC suppliers and maintains a leading industry position at the time of writing. ZTC ZTC Controls Ltd, a British supplier and designer of DCC systems now based in Yeovil after the former manufacturer ceased trading. ZTC has over 25 years of design and manufacturing experience and has supplied DCC systems for Network Rail training schools.